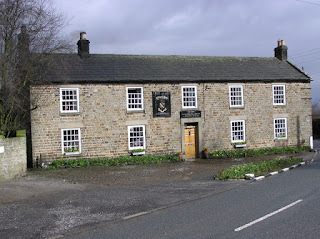 The village of Hunstanworth, a little to the SW of Blanchland overlooking the valley of the River Derwent, holds a unique status among all the settlements of County Durham. 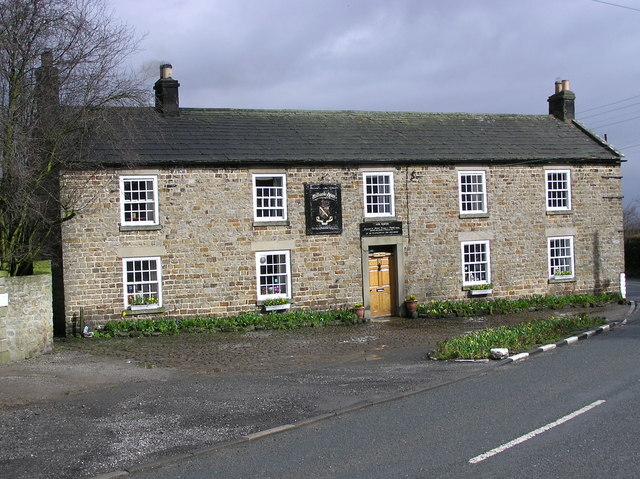 It is the county’s only ‘Thankful Village’ – being the only community that did not lose a single serviceman during World War I. There are only 50-odd Thankful Villages in the whole of Britain, which, when you consider how many such settlements there are across the nation, is a very small total indeed. Hunstanworth only sent five men to war during 1914-18, of which four of them, the Jamesons, were brothers. And they all made it back safely to their families. Note: Northumberland has only the one Thankful Village, too: Meldon. reuse under this Creative Commons Licence. A mile to the west of the remote village of Rookhope, Co.Durham, there lies an eye-catching relic of our industrial heritage in the form of a rugged stone archway. It sits quietly by the roadside and must leave the uninitiated passer-by somewhat nonplussed. It is known as the Rookhope Arch. It is more accurately the Lintzgarth Arch, really, sited, as it is, a few yards away from the site of the former smelting mill complex of that name, a little above the Rookhope Burn. Lead being once mined hereabouts, smelting mills were scattered across the Northern Pennines to turn the lead ore into a purer form of the metal (bars, or ‘pigs’). One such mill was that at Lintzgarth. Working with lead was a dangerous process, of course, and the fumes from the blast furnace needed to be funnelled away to a distant hilltop. 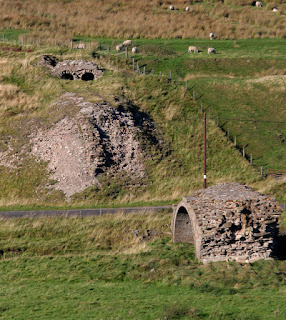 At Lintzgarth this was done by constructing a six-arch, raised horizontal flue leading from the works and over the nearby Rookhope Burn and road, then a 1½ mile-long underground section to a hilltop chimney. In the picture above you can get an idea of the series of archways, the road/burn and the lower reaches of the underground tunnel. The method of channelling the poisonous fumes out through a long chimney had the added bonus of allowing tiny fragments of lead (and silver) to stick to the inside of the structure – and these would of course be periodically scraped off for recycling by working boys. Nasty job – but, you know, waste not, want not. One of the most notable archaeological sites ever discovered here in the North-East of England no longer exists. It is (or rather was) the Heathery Burn Cave, a mile or so north of Stanhope, near the said burn’s confluence with the Stanhope Burn. Strangely, and somewhat appropriately, its discovery, its gradual unearthing and eventual destruction were all down to man’s quarrying activity. The Heathery Burn Hoard was one of the most important discoveries of Bronze Age artefacts ever made in this country. Though bits and bobs had turned up at the location since the 1750s, the story began in earnest in 1843 when, during construction work for a tramway for the nearby limestone quarry, the entrance to an existing cave was destroyed. Initially, eight bronze rings were found, and items continually turned up during quarrying (and some archaeological work) until the worksite’s abandonment in 1872. The assemblage essentially represents the complete household collection of a Late Bronze Age family, which seems to have taken refuge in the cave before being overwhelmed by flooding around 1150-800 BC. Highlight of the collected goods are six bronze cylinders of 4 inch diameter, which were probably nave-bands of a four-wheeled vehicle – the earliest evidence of a wheeled cart/chariot in Britain. There are some beautifully made spearheads, an assortment of knives and a score of axes. Amazingly, coppersmith’s tongs and axe moulds were also found, indicating that nearby copper ore was being processed. There were razors, gouges and chisels, too; and, for the women, a gold armlet, a bronze ring, plus bronze pins and bracelets, together with tooth and shell necklaces. There was also a large bronze cauldron/bucket, together with crockery and remains of food found thereabouts, as well as many more mundane domestic items fashioned from animal bones. In all, over 200 items were discovered – and, yes, there were some human remains, too. The Victorian quarrying work soon obliterated the site, and the relics scattered to several collecting houses – most notably the British Museum. More info and some nice illustrations can be found here. This great tree grew in a forest of the middle carboniferous period (about 250 million years ago) near Edmundbyers Cross now 1,550 feet above sea-level. As its vegetable matter decayed this was replaced by sand which has formed a perfect cast in hard ganister. The roots (stigmaria) show their characteristic form. The tree was brought to Stanhope and erected here in 1962 by Mr J.G.Beaston. Edmundbyers Cross is a little fragment of antiquity to be found by the roadside of the B6278 about three miles north of Stanhope – and the quarry in which the fossil was found (along with a couple of other specimens, apparently) is still marked on OS maps. The finds, which were made in 1905 (some sources say 1915), lay goodness-knows-where until one of them was deposited on the edge of the churchyard several decades later by the said Mr Beaston. The chap in question was a local quarrying entrepreneur with a particular penchant for ganister stone. Some consider the placement of the tree somewhat ironic given the church’s belief that the age of the Earth is around 6,000 years old! Anyone familiar with the upper reaches of the Wear Valley during the late 20th century will remember the blot on the landscape that was the Weardale Cement Works. 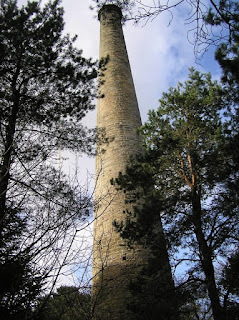 As well as, of course, being the area’s chief employer for the best part of four decades, the factory’s lofty tower served as a useful landmark for disoriented ramblers. The main ingredient of cement is ground limestone, and limestone quarrying has been a popular pastime in these parts since at least the 1840s. So when cement was ‘invented’ and its production encouraged in the early 20th century, the existing activity in the Wear Valley made it a likely spot for the manufacture of the new-fangled construction material. It wasn’t until the 1960s, though, that the industry set up shop at the location in question, a little to the west of Eastgate. The whole complex was spread over a large area. On the valley side to the south was the quarry itself; a little above this was sited the plant which crushed the stone; and a long conveyor belt took the spewed out material down and across the valley to the north bank where the rest of the cement production was, via a series of complex chemical processes, completed. The conveniently located Weardale Railway then took the finished product eastwards towards civilisation, though a good deal of it left the works in the familiar bright yellow livery of the Blue Circle lorries. The large chimney formed part of the latter works, being the smokestack of the kiln. Beginning life in 1965, the works themselves, though, enjoyed a relatively short-lived existence. The famous Blue Circle brand was taken over by French firm Lafarge in 2001, and operations ceased the following year when the company decided to concentrate its efforts on plants elsewhere in the country. By 2006 the whole plant had been demolished – and ramblers now wander lost among the fells with no guiding light to steer them home. 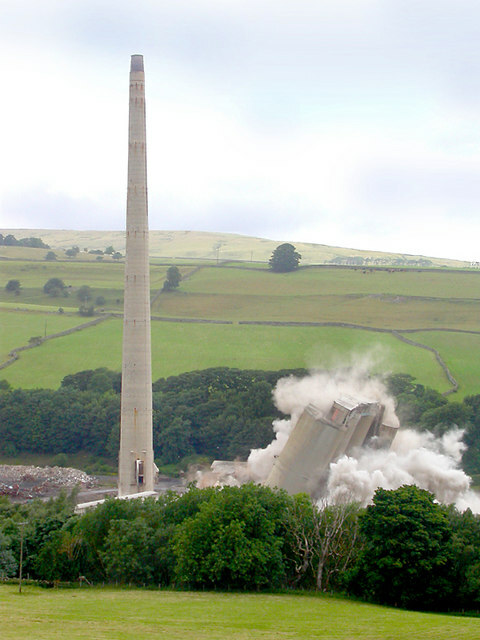 The photo above shows the demolition process taking place, with, it seems, the famous tower being the last element to fall. 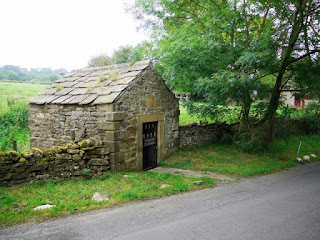 Of all the ‘holy wells’ we have here in the North-East, the one near the town of Wolsingham in Weardale is both one of our most remarkable and, on the other hand, perhaps our most under-whelming. As natural springs go it is nothing to write home about – at least not these days. It amounts to a tiny trickle of water rising up into a small puddle, and it has little in the way of local legend attached to its existence other than the purity of its offerings. But what makes it special is, of course, the substantial edifice which surrounds it: an apparently unnecessary small stone building, lovingly maintained over the years and guarded by an ornate iron gate. It is the largest structure built over a well in County Durham. The said gate offers the names of two saints, Aelric and Godric, by way of elaboration, but no one seems to be able to pin down any definite link between the watery spot and the esteemed individuals. The best we can come up with is that the former, a local hermit, was visited by the latter, a wandering pilgrim/pedlar, in the early 12th century, and the two of them spent a couple of years in the vicinity of the village doing whatever such men do. At the time there was thought to have been a small chapel operating near the well which utilised the waters issuing forth. But quite why the spot has been maintained for so long and in such an elaborate manner is a mystery. It is distinctive of Escomb that it has no history. It is just a little, obscure church – probably preserved by its lack of importance. Well, maybe so. Nevertheless, this “little, obscure church” of ours, nestling somewhat embarrassingly in the midst of a 1960s housing estate three miles west of Bishop Auckland, is arguably the finest example of its kind in Britain. Of the three surviving, intact Anglo-Saxon churches nationwide, our very own at Escomb is the pick of the bunch many say. Having been thus preserved by its “lack of importance”, it is now, ironically, perhaps our most treasured relic of Northumbria’s ‘Golden Age’. 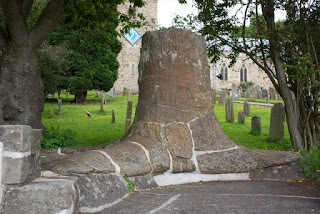 The monument’s – and indeed the village’s – early history are shrouded in mystery. Scarcely mentioned in our early written histories, even the source of its name is disputed. Undoubtedly Old English in origin, it may mean Edi, Eda or Ida’s combe (combe meaning a hollow enclosed with hills, or a valley); or, alternatively, may be a derivative of the O.E. edisc (park), Ediscum therefore meaning ‘a place where there are parks’. It seems likely, however, that there has been almost continual habitation in the area since Anglo-Saxon times. The site is certainly typically Anglo-Saxon in nature. 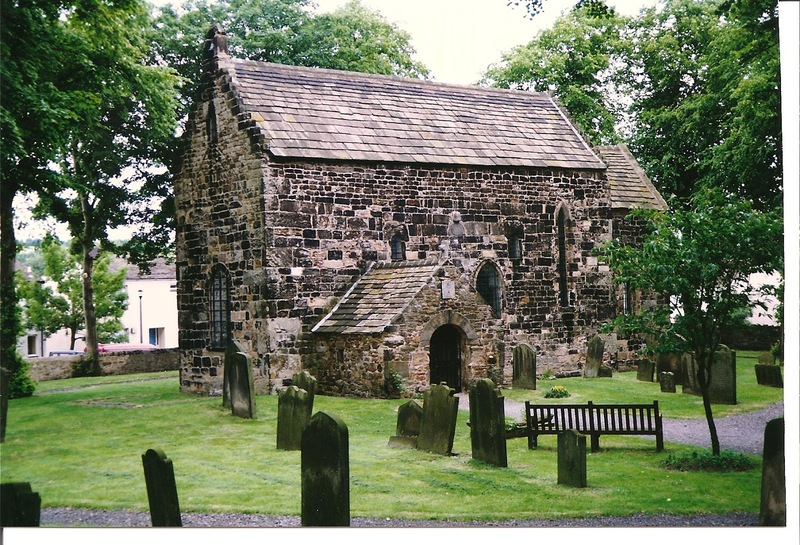 Although similar to its more famous and near contemporaries at Jarrow and Monkwearmouth (built 675-84AD), Escomb Church does, however, exhibit features of an earlier generation. It is, if you like, more ‘Celtic-like’. Prior to the 664AD Synod of Whitby, Celtic Christianity very much held sway over the Roman version in the North. Escomb, with its circular graveyard, pyramidal construction and Celtic artifacts, hints at a pre-664AD founding. It has unmistakable Celtic dimensions, too. Its official date of construction of c.675 is probably therefore a little conservative. The locals, once converted in the 640s or 650s, would have soon set to work on their place of worship – it is fortunate indeed for us that they chose stone rather than wood. The choice, though, was an easy one – the crumbling nearby Roman station of Vinovia (Binchester) provided ample pickings. Earliest documentary records dating from c.990-95AD concern the mortgaging or pledging of the estate (church included) to a Danish Earl, Northman, who, it seems, quickly sold it back to the See of Durham. It then fell under the administration of the parish of Auckland St.Andrew in the late thirteenth century, and its somewhat undefined role remained largely unchanged with its post-Reformation appointment as chapel-of-ease to its big brother. Come the nineteenth century and Escomb itself was finally made into an ecclesiastical parish in its own right. A vicarage was built in 1848 (priests had previously been non-resident) and all looked rosy. The tiny churchyard soon filled, however, and a new church was built and burial ground created as early as 1863 half a mile away. The old church was thus abandoned and left to decay. Thanks largely to the efforts of a certain Dr.Hoopell, however, the old building was rescued from imminent demise. Funds were raised throughout the late 1870s, local support rallied by the caring and much-loved incumbent, T.E.Lord, and tasteful refurbishment work carried out. Bishop Lightfoot did the honours on 4th October 1880 as the chapel was re-opened to the public. By all accounts Victorian village life was pleasant enough thereafter under the watchful guidance of the Revd Lord. The ‘new’ church remained the parish church; its ancient neighbour being used periodically when the fancy arose. Twentieth century life took its toll, however, and the village gradually declined until clearance work in the 1960s preceded the construction of the present housing estate. During the 1960s, too, it was decided to demolish the Victorian church (due to upkeep problems) – an act finally carried out in 1971. In the meantime the old Saxon church was overhauled again (including the installation of heating and lighting) in preparation for its restoration, once again, to the status of parish church proper in 1970. So, a “little, obscure church” with a fascinating story… and a happy ending! Don’t miss the chance to visit the place today; for if you’re ever in the area a quick diversion to take in the ‘Church of St.John the Evangelist, Escomb’ is well worth the effort. By reading the notice on the gate you’ll find the key to the same hanging on the wall of a nearby house (just take it without knocking). 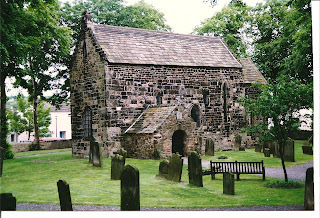 The church is open 9.00am-8.00pm during the summer and 9.00am-4.00pm in the winter. Mention should be made of some of its features. Internally, the building measures 43ft x 14ft (nave) – the chancel being some 10ft square. The walls are an impressive 2ft 5in thick, and the building stands some 34ft to the point of the roof. 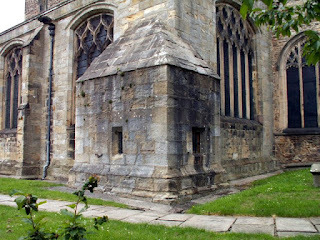 The southern porch and bell-cot were added during the twelfth or thirteenth century and, originally, there was an additional building to the west (the chancel is on the east wall) – though only traces of the foundations of this remain. Many extra windows have been added over the years. The site was, incidentally, excavated in 1968. Note the narrowing or pyramidal form of all the vertical features of the church, including the building itself. Curiously, the upper courses of stone are much smaller than the rest (though still the originals). Inside, there are medieval grave-covers lining the porch, an odd-shaped font and some original Anglo-Saxon pebbled flooring to the west of the nave. But most interesting of all is the cross fragment behind the altar and the complete Roman arch which now frames the entrance to the chancel – undoubtedly from the Binchester ruins. The fading artwork on the underside of the arch is some 800 years old. Roman markings adorn the building inside and out. Indeed, many of the stones have clearly been fashioned by Roman masons. High on the exterior of the north wall is the legionary inscription “LEG VI”, though another legend on the inside of the same wall was not spotted until 1969 by an eagle-eyed schoolboy! Evidence of an earlier age comes in the form of the Celtic cross over the porch entrance. What is probably the oldest Saxon sundial in the country sits high on the south wall, whilst a seventeenth century version adorns the porch. Today the church is whitewashed within, but most probably would have also been brightly plastered without, too, in the Middle Ages. Those twelfth century paintings would also have adorned a good deal of the interior. By sitting alone on the back pew in complete and utter silence it is easy, even today, to picture the ancient scene of yesteryear. Simple, austere, reverent beauty. The large expanse of greenery which coats the valley of Bedburn Beck and its tributaries in County Durham is now a popular area of recreation for locals. It is, of course, known to all as Hamsterley Forest, and though it is the largest forest in the county it is a surprisingly modern creation. Ancient woodland it may not be, but at 2,000 hectares (that’s around 5,000 acres), this popular family venue was, rather pleasingly, created during a very bleak period in our recent social history. Until it was purchased by the Forestry Commission in 1927, the huge tract of land belonged to the Surtees family and was dedicated to agriculture and shooting; but very soon after it changed hands – in 1934 – it was utilised by the Ministry of Labour as a work camp for the unemployed (of which there were a fair few around at the time). Tracks were laid out and trees planted over an intense four year period as part of a nationwide attempt to avert any possible future timber shortages. During this brief, and very tough, time, a network of ‘Instructional Centres’ were built across the country and workmen lived on-site in wooden huts. The unemployed fellows in question were required to carry out set periods of work (typically six weeks) in return for free clothing and a little pocket money. In the run-up to war, the unemployment situation eased and the forestry work ceased. World War II hardly brought a break in usage for Hamsterley Forest, though, as German and Italian PoWs were incarcerated there in the existing barrack blocks – which must have been quite nice for them (in the circumstances). In time the trees matured, and today the forest is run primarily as a commercial enterprise by the Forestry Commission. On the face of it, though, it seems to exist for the recreational benefit of the general public – including a rather nice four-mile Forest Drive. Lead mining and smelting was big business in and around the Pennines in days gone by. There are remnants of the industry scattered far and wide across the landscape of the North-East – from the distant hill-tops down to the staithes on the region’s rivers. ‘Lead roads’ snaked between the smelting mills in the towns and villages of the foothills down to the waiting boats on the Tyne and the Wear – a large, if minority, business which has long since passed into history. Most conspicuous of all these relics is the distinctive smelting chimney: a giant stone tower sitting atop a lofty prominence on a distant horizon. If you’re out and about in lead mining country you will still see plenty of these around, even if they are usually in a ruinous state. Connecting these chimneys to their often very distant smelting mill there would have been a conducting flue which carried the poisonous fumes up into the hills and belching out into the atmosphere. One splendid, and quite complete, example of this landmark stands tall and proud just outside the little village of Copley, above the River Gaunless in Co.Durham. It was the exhaust pipe of the Gaunless Valley Lead Mill, and is of sandstone construction with ashlar dressing. The mill operated from 1790 to 1880, though the chimney dates from 1832 and now stands in splendid isolation amidst the delightfully named Gibbsneese Plantation. You can’t miss it. Hooked around the northern reaches of the village of Cockfield, Co.Durham, are large expanses of open and largely redundant common land. It is not the prettiest place on the planet, nor is it, you would have thought, the most obvious haven of historical interest. But, whilst you may not want to take your family a-picnicking on the low-lying hills of Cockfield Fell, you may be surprised to learn that hereabouts forms one of the most important sites in the region when it comes to industrial heritage. And it is, in fact, the largest Scheduled Ancient Monument in England. At 350 hectares (that’s 850+ acres in old money), Cockfield Fell has been described as “one of the most important early industrial landscapes in Britain”. There are traces of human activity here (in the shape of flint arrowheads) stretching back 10,000 years; and there is clear evidence of pre-Roman occupation, too, by way of at least four Iron Age settlement enclosures. A rectangular-shaped earthwork may, it is thought, be Roman; and there are plenty of Medieval remains to be found, too (field systems, quarrying, etc.). Most interestingly, though, documents name Cockfield Fell as one of the earliest (the earliest?) known sites in the North-East for coal mining – the Bishop of Durham having issued a licence for such activity in 1303 – and a proper colliery was established in 1375 by William Vavasour. Consequently, a good deal of waste soon built up on the fell; and the general mess was greatly added to when whinstone quarries were subsequently dug around and about. The railways also made their mark, primarily with the Bishop Auckland-Barnard Castle line which once swept across the fell (1862-1962). In 1869 the moorland became a ‘regulated pasture’, which effectively turned it into a grazing area. If you’re not a very arty person you may not have heard of a marble statue by the name of The Greek Slave. In fact, it is one of the most important sculptures of the nineteenth century – it being especially highly rated in the USA, as it is the work of their very own Hiram Powers. And I am pleased to report that it sits here in the North-East, amidst the artistic treasures of Raby Castle. It was created by Mr Powers in 1844, was exhibited at the Great Exhibition of 1851 in London and then bought by the 2nd Duke of Cleveland of Raby Castle in 1859 for £1,800. At nearly 40 stone in weight, it can’t have been an easy delivery to make, via train and truck from the capital to its new home in Co.Durham. In case you’re wondering, the statue represents a life-size Greek Slave girl standing, chained and fully naked, at a Turkish slave market. During Victorian times, as you can imagine, it was a very controversial piece – so much so, in fact, that at many exhibitions men and women were obliged to view it separately. The young lady’s innocence is illustrated by the presence of a small Christian cross hanging near her right hand. That at Raby Castle is one of six marble copies that were created – with ours being the first (primary) copy, created from first a clay, then a plaster, ‘original’. 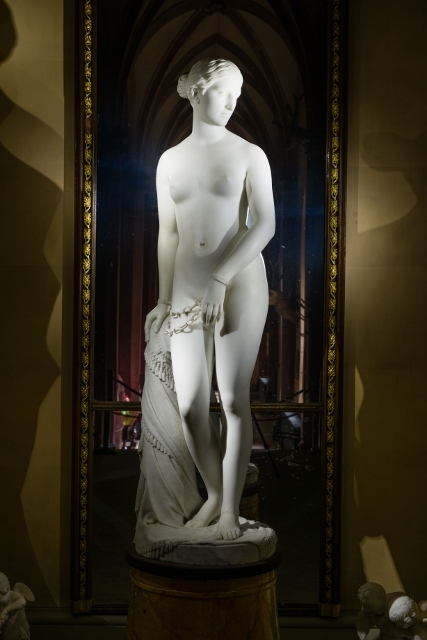 Powers worked out of Florence, and the primary marble copy was purchased by an Englishman in 1845. It appeared in several exhibitions – including the famous Great Exhibition – before its move north. The Slave has been taken from one of the Greek Islands by the Turks, in the time of the Greek revolution, the history of which is familiar to all. Her father and mother, and perhaps all her kindred, have been destroyed by her foes, and she alone preserved as a treasure too valuable to be thrown away. She is now among barbarian strangers, under the pressure of a full recollection of the calamitous events which have brought her to her present state; and she stands exposed to the gaze of the people she abhors, and awaits her fate with intense anxiety, tempered indeed by the support of her reliance upon the goodness of God. Gather all these afflictions together, and add to them the fortitude and resignation of a Christian, and no room will be left for shame. All the other full-size versions are to be found in the USA, though a smaller-scale affair is held by the V&A, London. In the days before police constables as we know them plodded the streets of our towns and villages, general law and order was a somewhat haphazard affair. Quite often it would be the local churchwardens who would be pressed into service when a miscreant was identified – and any troublesome individuals would, temporarily at least, be thrown into a local ‘lock-up’ until they cooled down a bit. There are not a lot of these curious little buildings left, but one such strongroom remains in the village of Staindrop – still resolutely attached to the substantial church of St.Mary’s. Very little is known about its history, other than it was originally added to the south aisle several hundred years ago as a vestry to the chantry chapel (the Lady Chapel, actually) to which it is attached. Its change of use necessitated the opening up of an external door (see above – right-hand window) – indeed early photographs of the building still show the door intact. It has since been reformed into a window. Around and about us there are layers of history buried beneath our feet. The vast majority of it remains hidden and undiscovered, a good deal has been wiped out completely – and just here and there can be found tantalising glimpses into the world of our ancestors. Only by tapping into the archives can we begin to make a little sense of these faint ghosts from our distant past. South Durham has many such spots. The Romans drove Dere Street through these parts, of course, and much of the human activity that followed during the Dark Ages was wiped from the face of the earth during the Norman ‘Harrying of the North’ and other such cleansing operations. Later still creations, such as the remarkable lost village of Ulnaby (13th-16th centuries) as well as that at Walworth (among others), provide evidence aplenty of the fluctuating fortunes of local life. And at the little village of Summerhouse, a few miles NW of Darlington, lies another odd little example of our mysterious past. At the southern extremity of the settlement’s north-south village green can be found an area of apparently open countryside – but which, in fact, contains a series of winding earthworks. As can be seen from the image above, the small, central section encloses an area of land (about 15m or so square), with a southern ‘feed-off’ into a larger moated area. 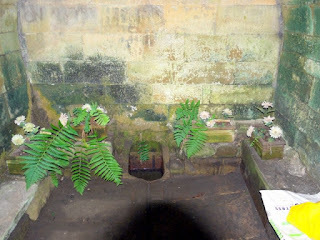 Towards the west there is a sluice-gate which regulated the flow of water into the system from a small lake. The lake is now a wood. Not a lot is known about exactly what the system of moats was protecting, but the faint remains of a tower within the smaller enclosure suggest that there was a fortified manor house on the spot. Adjacent and to the south lie remains of another, larger building – then there is the even more expansive and partly-moated area further to the south. 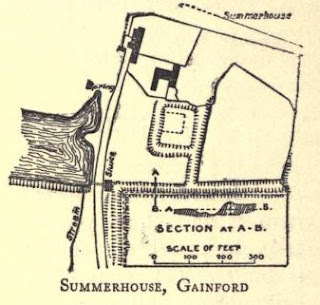 All very mysterious, and abandoned long, long ago – though it is likely that the earthworks may hint at a connection to the Raby estate (their ‘summer house’? ), and the monks of Durham City also had interests hereabouts. By way of further illustration, here is a splendid aerial shot (taken from the west, facing east). The town of Barnard Castle is, of course, named after its, er, castle – but who, or what, was Barnard? Turns out that the Barnard in question was actually a Bernard, with historical origins stretching back to the time of the Norman Conquest. Bernard Balliol (or, rather, Bernard de Balliol I), was a twelfth century nobleman whose father, Renard, and uncle, Guy de Balliol, had literally come over with the Conqueror during the Norman invasion. As a reward for his military service in Normandy, Uncle Guy was handed the Lordship of Gainford at the very end of the eleventh century, and he set about building a wood and earthwork fortification on the site of the later ‘Barnard Castle’. Then, when his nephew, Bernard, succeeded him in the 1130s, the stronghold was rebuilt in stone, like so many others the country over. Bernard I died around 1150-60 and was succeeded firstly by his son Guy, then almost immediately by a younger son, another Bernard. And though the castle was much adapted over the succeeding centuries, the work done by the two Bernards during 1130-1190 cemented ‘Bernard’s Castle’ as the name for the settlement which developed around the stronghold. In time, this became ‘Barnard Castle’, which is what we’re stuck with today. I’m sure you don’t need me to remind you that the Balliols had a colourful history, what with their connections in Normandy, England and, of course, Scotland, where John Balliol was king during 1292-96. John, in fact, was most probably born in Barnard Castle around 1249. And the castle also had strong connections to the English throne, being later owned by ‘Kingmaker’ Richard Neville and King Richard III. 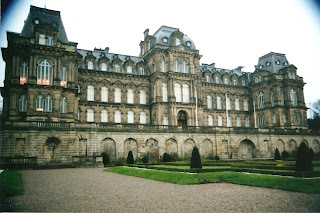 The extraordinary mansion that is the Bowes Museum lies on the eastern fringes of Barnard Castle. Designed and constructed in the French Renaissance style, it is perhaps the North-East’s greatest oddity, being so obviously out of place. And, perhaps just as strangely, it is a purpose-built museum and has never been used as a residence. It was the brainchild of a rather odd couple, too: the illegitimate John Bowes, a rogue branch of the family line that was to produce Queen Elizabeth the Queen Mother, and one Joséphine Benoîte Coffin-Chevalier, Countess of Montalbo (San Marino) who was an employee of a Parisian theatre. The two had met and fell in love during one of John’s long stays in the French capital, during which time he bought the establishment in which Joséphine worked. They were married in 1852. John’s wife was big on art, and her husband soon came to share her passion. And so, around a decade into their marriage, they began collecting pieces of art for their own gratification and with the long term intention of establishing a public museum – funded by John’s coal industry dabblings. The collection soon grew to mammoth proportions. The late Mr Bowes and his first wife, the Countess of Montalbo, when they formed the idea of founding a museum, did not originally propose to locate it at Barnard Castle. Their first idea was to place it at Calais, within the Countess of Montalbo’s own country, and yet looking towards England, Mr Bowes’ country. They abandoned this idea from a consideration of the permanently unsettled state of politics in France. They thought there was less chance of revolutions occurring in England than in France, in which the works of art might be injured. It took years to bring the plan to fruition. It was not until 1872 that the building work commenced in earnest, but it then ceased in 1882 on account of a slump in the coal trade. In the meantime, Joséphine died in 1874 and John followed her in 1885 – but they made provisions in their wills for the completion of the museum. The establishment finally opened to the public in 1892 and was a massive success. In days of old there could be found many hundreds of institutions known as ‘alehouses’ scattered across the nation, which were essentially domestic dwellings that brewed and served ale. In time, of course, there developed the traditional ‘pub’ as we know it – commercial institutions specialising in the boozing business – and the basic alehouses fell from use. Most alehouses didn’t really have proper serving bars; folk just turned up and bought their beer from the house owner/tenant. 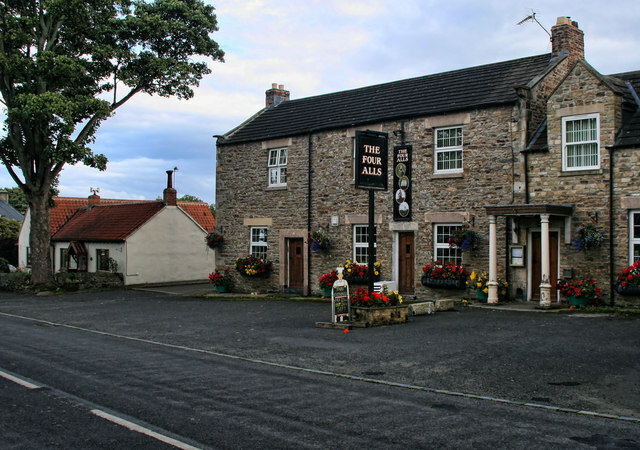 Across the UK today there are less than ten such survivals from the distant past – and one of them is the Milbank Arms, Barningham, on the Co.Durham side of its border with North Yorkshire. It looks like a regular public house from the outside, but on entering you are faced with little in the way of pub-like options. The landlord will be there waiting for you at the top of the cellar steps, and he will fulfil your request by scampering down to, and up from, the cellar. And if you’re interested, there are plenty of fancy cocktails to choose from, too (their speciality, in fact), and the cellar stairs are adorned with thousands of miniature bottles. There is a small tap room for visitors to down their drinks, actually, as well as a seldom used ‘domino room’. It is on the Campaign for Real Ale’s National Inventory of Historic Pub Interiors – and quite right, too. Hutton Magna’s two most curious items are located within a few feet of each other in the centre of the village. Both are contained in the image above and they are very different in their nature. The first is, obviously, the red telephone box – or the ‘News Box’ as it is affectionately known. It is always a delight to fall upon one of these distinctive and well-loved landmarks, especially as they have been disappearing from our landscape at an alarming rate of late. 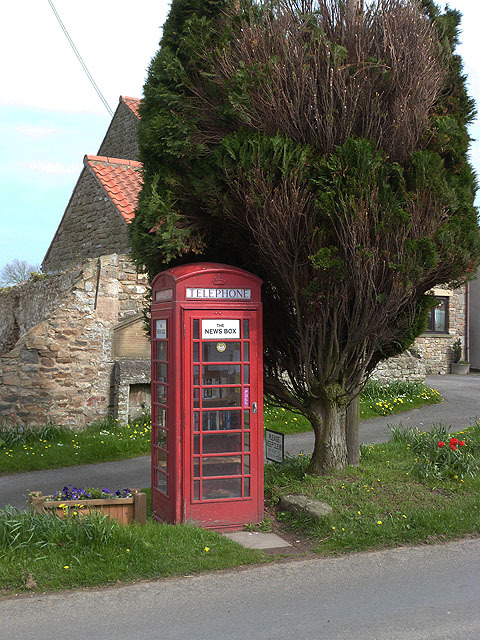 When the same fate threatened to swallow up Hutton Magna’s specimen in 2009, the villagers asked if they could buy it from British Telecom – and they did… for £1. Unfortunately, it then cost them £250 to have the phone disconnected! Suitably phone-free, the locals decided to turn the little box into their very own multifunctional village ‘News Box’, complete with community notice board, lending library (books and DVDs) and newspaper distribution point – together with any other bits and bobs which folk are happy to pass on. Nice. Just behind the ‘News Box’ can be seen an old water tap and commemorative tablet. The latter pays tribute to one Cuthbert Watson of nearby Ovington, who, in 1858, laid a water pipe from Warden Hill to the spot in order that the villagers might at last have a fresh water supply. It ran for 1,200 yards and was initially a great success … until, twelve years later, the iron that the pipe was made from rusted up and, well, that was the end of that. They should have seen that one coming. An 1890 account tells us that the supply had still not been reinstated. One assumes that the problem has now been rectified. I Govern All, I Fight for All, I Pray for All, I Pay for All. On the ‘Five Alls’ version, a lawyer may appear with the motto ‘I plead for all’. The Devil may also pop up, too, from time to time! © Copyright Hugh Mortimer and licensed for reuse under this Creative Commons Licence. 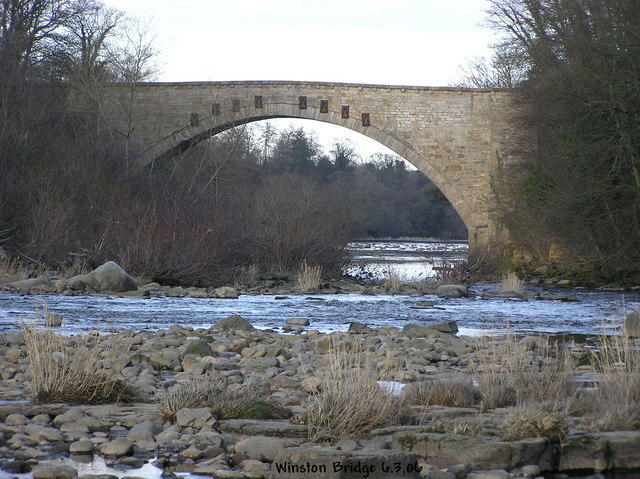 Winston Bridge straddles the River Tees at a point which may once have been bridged by the Romans. There was certainly a medieval bridge dating from around 1424, though the current effort was thrown up in the 1760s. It is a rather special structure in that at the time of its erection it was the largest single-span stone bridge in England – and most probably, in fact, the whole of Europe. It was the work of amateur architect, Sir Thomas Robinson, and measures some 112ft (34m). Impressively, it was one of a handful of bridges on the Tees to survive the Great Flood of 1771. It is built from hard blue ragstone – which means that the material, astonishingly, came from Kent – though even this robust old structure has recently been strengthened by the addition of iron bolts (which can be clearly discerned in the picture above). It once played a crucial role in the transportation of coal from Durham to Yorkshire, but the rise of the railways soon put pay to that. Still, though, it rose to fame again as recently as 1988 when a Spitfire was flown through its airy expanse for the TV war drama A Piece of Cake – an impressive piece of footage which was then reused in the even more recent Foyle’s War. Though the story dates back to relatively recent times, the truth is difficult to pin down precisely – not surprisingly, really, as the tale concerns one of the most eccentric families the North-East has ever produced, the Edlestons. Mainly, they were weird in a good way: they had always been big in the parish and were renowned for their good turns. Following the death of 79-year-old Joseph Edleston in 1895 (who had, in the past, served as vicar of Gainford and done his share of good deeds for the locals) an almighty storm blew up over how his legacy should be marked. 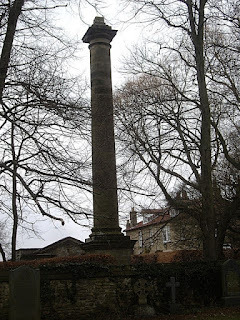 The exact sequence of events is not known, but, basically, the family, having buried the old man near his Cambridge home, wanted a suitable memorial erected in the church grounds here in Co.Durham. The authorities, though, said the graveyard was full and suggested that the Edleston’s could donate some of their adjoining land to the church and put the memorial there. Suitably miffed, the family decided instead to keep the land in question and erect a large building known as a ‘spite house’ on the site to annoy the local clergy – a structure which is still there, and is known as Edleston Hall (shown in the background of the above image). The hall bears the date 1904; but, several years later, and still seething, they added an imposing column placed right up against the graveyard wall. In typically eccentric fashion, they had purchased the ‘item’ from Stanwick Park/Hall, Yorkshire, in the 1920s and transported it north. Some accounts suggest an enormous V-sign once sat atop the pillar, but the two-fingered gesture was probably metaphorical – I’m quite sure the giant tower on its own said it all. Moreover, this is only a very small part of the extraordinary tale of the Edleston family – more can be found archived away, here. 2009 – Time Team excavation/evaluation. A couple of miles south of Darlington, in a lonely field near the A167, lies a curious geological feature called Hell’s Kettles. Its story, amazingly, goes back to the 12th century, and it may well hold a unique place in the history of our nation’s literature. The ‘kettles’ themselves are a couple of ordinary looking ponds by the roadside – the sort of thing you would skirt past without even noticing, ordinarily. They are said to have been formed in 1179 following a dramatic incident of subsidence. 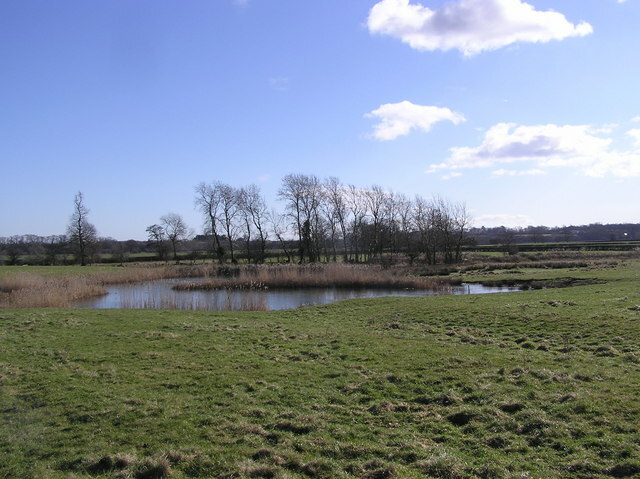 There are only two these days, but historical reports suggest that four ponds once existed here – one having been filled in, and two of the others have merged into one. The sudden appearance of these sink-holes can be explained by the rapid erosion of the gypsum-like rocks near the surface which resulted in the sudden collapse of the ground. Surface run-off and underground springs then filled the voids – and, of course, the seemingly bottomless nature of the little lakes has since fed the imaginations of the locals over the centuries. 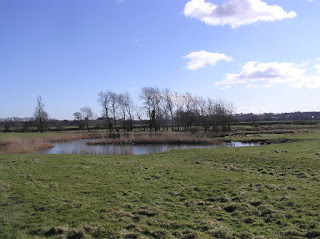 Of the two that remain, one is unremarkable in that it is filled by run-off water, but the other (the southerly one, called ‘Croft Kettle’) is the only open-water expanse in the county fed by subterranean springs, and has therefore attracted a very special collection of biological growth. Hence, Hell’s Kettles is now a Site of Special Scientific Interest. In the reign of Henry II, the earth rose high at Oxendale, in the District of Darlington, in the likeness of a lofty tower, and so remained from nine in the morning until evening, when it sank down with a terrible noise, to the terror of all that heard it, and being swallowed up it left behind a deep pit. Intriguingly, it has recently been suggested that Hell’s Kettles may have inspired the scene in Lewis Carroll’s Alice’s Adventures in Wonderland in which Alice tumbles down a rabbit hole. Charles Dodgson (Lewis Carroll) would certainly have been familiar with Hell’s Kettles, living, as he did, at nearby Croft for so long. Additionally, of course, he would have been well versed in the local legends surrounding the feature: animals and humans drowning and being lost in the pools, the voices of lost spirits thereabouts, and endless stories of the ‘bottomless’ nature of their depths.